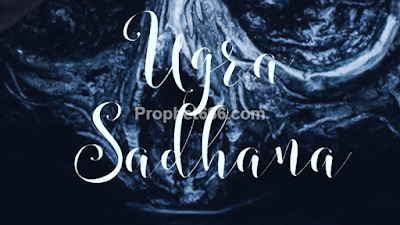 Ugra Sadhanas sometimes involve offerings of meat and flesh, blood and liquor to the deity and even fearsome practices like Shava Sadhana, which involves sitting on a human corpse and Chanting Mantras or indulging in Maithuna or physical union with the dead body. However, it is of utmost importance for the practitioner to first understand and be fully aware of exactly he wants to achieve by performing Ugra or Aghori Sadhana and what is the real meaning and purpose of performing Ugra Sadhanas. In some Ugra Sadhanas nothing is forbidden or restricted and all the rules of normal existence are transcended. The actual purpose of Ugra Sadhana can also be termed as trying to “Break the Matrix” or trying to break free from the rules and regulations that have been implanted into the mind and force the mind to behave. act and react in a certain manner. Some advanced practitioners of Ugra or Aghori Sadhana say that they are trying to change the way in which the mind is tuned and programmed or trying to come out of that program and create a new set of rules, which are controlled by them and not by the program. The real purpose of fearsome Sadhanas, like Shava Sadhana is to gain Moksha or liberation from the unending cycle of life and death. Liberation can also be termed as “Breaking the Matrix” or transcending the program. However, most practitioners of Ugra and Aghori Sadhana are unaware of this and do not even know the actual purpose of these Sadhanas. It is true that they break some rules, but replace those rules with another set of rules and regulations, thus, changing the functioning of the mind from one program to another “less advanced” or primitive program. This makes the temperament and personality of most Aghori Sadhaks fearsome and egoistic and they most come across as angry and abusive people, who have by strong auto suggestions psyched themselves, into believing that they are most powerful Aghori Sadhaks who can make or break others. This is in contrast to most Sadhaks of Satvik Sadhanas who come across as humble and polite people. However, this is a generalized trait that is seen in most Ugra and Satvik Sadhaks and there are likely to be a certain percentage of Satvik Sadhaks having inflated egos. I am speaking in general terms about Aghori Sadhaks who perform Ugra Sadhanas, however, there are some highly advanced Sadhaks of the Aghori Tantra who have transcended the mind and gained supernatural powers and also developed their extra sensory perception by performing Ugra Sadhanas. The Aghori Sadhak is trying to achieve exactly what the Satvik or Rajsik Sadhak or the practitioner of Kundalini or other forms of meditation is trying to achieve, which is to transcend the mind and connect with the over-self. They only difference is that they are using different methods to achieve the same thing. Thus transcending the mind is the central and common factor in all these highly advanced Sadhanas. In any of our readers are practicing Ugra and Aghori Sadhanas, like Ugra Hanuman Sadhana, Ugra Bhairav Sadhana or Ugra Kali, Tara, Baglamukhi or Sadhanas of any of the Dus Mahavidya Devis or Veers or any other Ugra Sadhana, kindly share your experiences, so that other readers can benefit from them. अपने इष्टदेव /इष्टदेवी ,कुलदेवता /कुलदेवी या अन्य देवी देवताओं की हम प्रायः सात्विक मन्त्रों से आराधना करते हैं .यही सामान्य और गृहस्थ लोगों के लिए उचित भी है .प्रायः सभी देवी देवताओं के षट्कर्म (शान्ति ,वश्य,स्तम्भन,विद्वेषण ,उच्चाटन,मारण)के सभी कर्मो की सिद्धि के लिए मन्त्र पाए जाते हैं .इनमे से शान्ति व् वश्य कर्म सम्बन्धी मन्त्र साधनाओं को छोड़ अन्य प्रकार के मन्त्रों की साधना थोड़ी भिन्न और उग्र प्रकृति की होती है .वश्य.स्तम्भन,विद्वेषण, उच्चाटन उतने गर्हित कर्म नहीं हैं ,जितना मारण .मारण मन्त्र की साधना का निषेध किया गया है .यह तभी करना चाहिए जब शत्रु से स्वयं के या परिवार के सदस्यों के लिए प्राणो का संकट हो .करो या मरो की स्थिति हो. काली,तारा,चामुंडा,धूमावती,बगलामुखी ,छिन्नमस्ता ,उच्छिष्ट गणपति ,नृसिंह उग्र देवता माने गए हैं .इनकी उपासना में त्रुटि नहीं होनी चाहिए .तनिक सी भूल से हानि हो सकती है .अतः उग्र साधनाओं से बचना चाहिए .